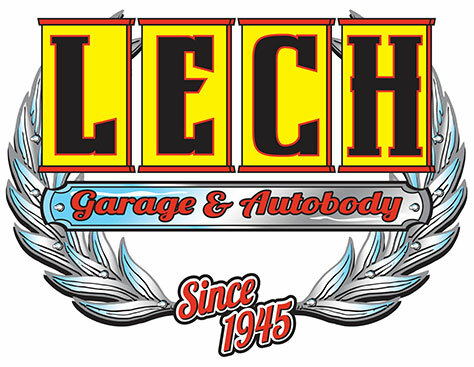 Founded in 1945 by Joseph Lech Sr., Lech Garage & Auto Body is a third-generation family-owned and operated auto body repair, mechanical service and towing facility. Joe Lech Sr. began his career repairing trucks as a young man for his fathers dairy business in the late 1900’s. He later worked for Hemingway Trucking as service manager; he was in charge of a fleet that serviced the entire Eastern United States. In 1945 Joe decided to go into business on his own and began with a small truck and service repair station with gas pumps. In 1946 at the age of sixteen Joseph Lech Jr. began working for his father in the shop, he became very knowledgeable of transmissions and became very interested in towing. The original location of Lech Garage was on 318 Shaw Street in New Bedford. Together they moved the business to Kenyon Street and Belleville as they outgrew the original location. By this point in time the business had made its mark in New Bedford as a premier repair facility with a reputation of honesty, backed by superior work. In the year 1963, with the expansion of Route 195, the business relocated to its present location on 103 North Front St. At this time the new building was built with modern auto and truck lifts, a state-of-the-art semi-downdraft spray booth and frame repair jigs. The towing fleet was now one the largest in the area, towing cars to heavy duty trucks 23 ½ hours a day. Jeannine Lech, Joe Jr.’s Wife, began working in the business in 1978 as the bookkeeper. Her knowledge of business helped to thrust the business in its next phase of expansion. In 1985 a 40′ x 120′ addition was added to the rear of the building to expand the auto body and heavy truck repair and the office area was modernized. In 1987, Christine Lech-Goulart, Joe & Jeannine’s daughter, began working for the family business after graduation from Bridgewater State College. Her passion in the business was auto body and repairing wrecked cars. She became completely involved in the auto body by learning from the ground up and working to become a Massachusetts Licensed appraiser. She is an ASE Certified Master Collision Technician, holding certificates in structural, nonstructural, steering, suspension, electrical, painting and refinishing. She is also an ASE Certified Damage Appraiser and certified by Dupont Automotive Paint in refinishing and color tinting. She holds certificates in IMACA for auto air-conditioning, anti-lock brake systems and air bag systems, Chief frame measuring, and a Mass licensed safety/emissions inspector. In 1992, Michael Goulart Jr. joined his wife Chris and her family in the business and became the company’s service manager. Michael enjoyed tinkering with cars since he was a kid. After high school he decided to enroll in school at ITT Tech to further his knowledge of cars and how they work. Upon completion of ITT Tech he enrolled in UTI Diesel repair school where he completed training in heavy duty truck repair. Michael is an ASE L1 Technician and holds an ASE Service Consultant Certificate. He also is a registered emissions repair technician, certified by the state, and a licensed safety/emissions inspector. Michael continues to enhance his knowledge of today’s automobiles by attending classes for OBDII systems, hybrid autos, computerized control systems, and modern engine controls. In 1999 more land was purchased adjacent to the existing business and preparations began for another addition of a 46′ X 60′ building to expand the auto body with the installation of a down draft baking spray booth, a computerized wheel alignment machine and frame/unibody shop. In 2003 another heavy duty tow truck, a 60-ton tri-axle, was added to the fleet. Lech Garage & Auto Body is extremely proud of their superior craftsmen and the quality of work they produce. Their technicians apply years of experience, knowledge and judgement to expertly restore vehicles to pre-condition. When you think about it a lot has changed in 60 years. But, after all this time there are some things which have remained the same. One good thing is that Lech Garage & Auto Body Inc. is still around and thriving after 60 years of hard work and dedication by everyone involved. Joseph W. Lech Sr. would certainly be proud! 1945 – Joe Lech, Sr. founds Lech Garage & Auto Body, Inc.
1946 Joe Lech, Jr. joins the business with expertise in transmission and interest in towing. 1946-1962 – Business moves to Kenyon Street and Belleville. 1963 – Business relocates to 103 North Front St. All new state-of-the-art facility is built and tow fleet is expanded. 1978 – Jeannine Lech joins the business as bookkeeper thrusting the business in its next phase of expansion. 1985 – Building is expanded and facilities modernized. 1987 Christine Lech-Goulart joins the Lech team with a passion for auto body and repairing wrecked cars. 1992 – Michael Goulart Jr. joins the business as Service Manager. 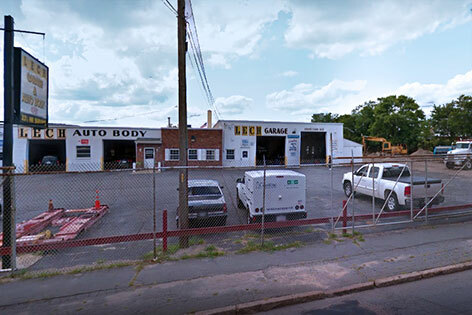 1999 – Adjacent land was purchased for the expansion of the auto body shop. Expansion included the installation of a down draft baking spray booth , a computerized wheel alignment machine and frame/unibody shop. 2003 – Another heavy duty tow truck, a 60-ton tri-axle, was added to the fleet. Present – Continued dedication to superior craftsmen and the quality with commitment to further improvements in facilities, equipment and staff training in order to provide the top quality service that is known as Lech Garage & Auto Body.